ORION Minerals, a Johannesburg- and Sydney-listed exploration company, said it had agreed with lender, Tembo Capital, that the UK fund provide a $3.6m loan facility. The facility is convertible into Orion shares at 2.6 cents/share, the same value as contained in an earlier convertible note between the two. The existing convertible note agreement has been extended to September 30 whilst Orion nears completion of a bankable feasibility study (BFS) into its Prieksa Zinc-Copper project in South Africa’s Northern Cape province. The study is due to be finalised in the second quarter of 2019. An earlier deadline of the end of 2018 had been previously set. 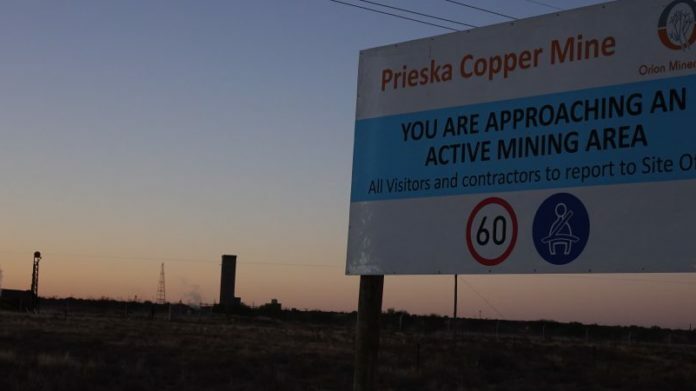 “Our focus is on bringing Prieska into production as quickly as possible, based on the parameters outlined in the positive Scoping Study released in December 2018. The BFS is well advanced and on track to be completed in Q2 2019,” said Denis Waddell, chairman of Orion Minerals in a statement. Orion announced on January 15 that the total mineral resource of its Prieska copper and zinc project totalled just over 30 million tonnes. Once Orion receives regulatory approvals and funding it would take about two to 2.5 years to develop the mine to first production. A mine of this size could cost about A$250m, the company said. The resource is situated on the site of an old mine previously operated by Anglovaal Mining in the Eighties. At the time it employed about 4,000 people.